What’s new in Carbonite licensing? All Carbonite Office plans protect the files on an unlimited number of computers, external hard drives and NAS devices, plus it’s encrypted for ultimate security. If you don’t have any servers, Carbonite Office Core is the best bang-for-your-buck. If you need to add server backup or the ability to protect databases and applications while in use, I would suggest the Carbonite Office Power plan. Finally, for unlimited computers & servers, you can take a look at the Carbonite Office Ultimate plan. As always, feel free to give us a call at 800-433-6326 or you can chat with us online at our website – www.genesis-technologies.com. Adobe CC: What’s new for video editors & directors? As you’re probably already aware of, a subscription to Adobe Creative Cloud gives you access to new features and updates as soon as they’re released by Adobe. In the new Premiere Pro CC (2016) and After Effects CC (2016), you’ll find new “ingest workflows” which will allow you to continue editing while importing in the background. Of course, the ability to do that is not entirely novel but you can be sure that the speed and **important** STABILITY will be greatly improved. With the latest software updates you’ll be certain that your expensive computing hardware will be used to its fullest extent, allowing you to work with any type of video format. Plus, you could even work in native 8k! Read more about the latest Adobe Pro Video innovations for 2016.. 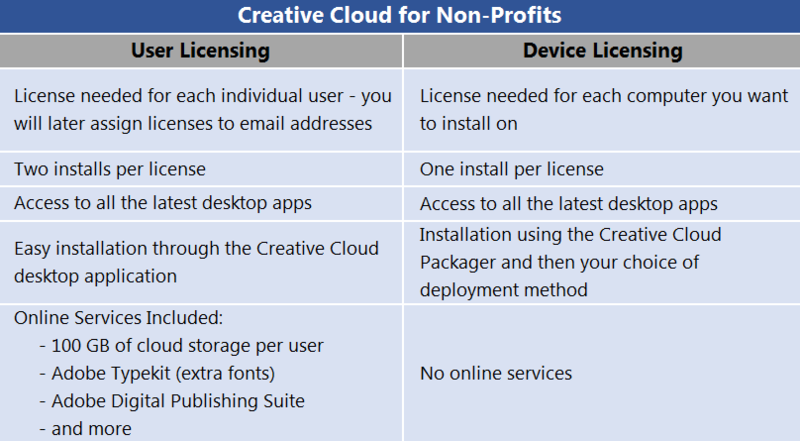 When signing up for Adobe Creative Cloud licenses you will have to choose to license on a PER USER or PER COMPUTER basis. As a rule of thumb, the USER licenses are a bit more expensive but they offer more flexibility. If you purchase user licenses you will have to assign each license to a single person’s email address. The assigned email address can be changed at any time. Then that user will be invited to join your Creative Cloud team. Each user will then have the flexibility to install on 2 computers plus they will gain access to 100 GB of cloud storage. For this option you’ll simply purchase the exact number of licenses as computers you want to install on. You will not assign these licenses to an email address. The only downside to this option is that the installation process is MUCH more complicated than it is for user licenses. It’s really more designed for a computer lab environment where an IT administrator is in charge of deploying the software and then multiple users can share the computers. Of course, with any option you choose you’ll receive a great discount on non-profit licenses by ordering from Genesis Technologies. Feel free to reach out at 800-433-6326 if you have any additional questions! After submitting an order to us and providing the necessary non-profit/501c3 documentation, the order is sent off to Microsoft for processing. That normally takes anywhere between 3-5 days after which you should receive an email from Microsoft with instructions on how to access and download your licenses. If you can’t find that email, these instructions below should help shine some light on the process. Your Microsoft Open License order has been processed by Microsoft, and your licenses have been issued. You need to sign in here using the email address that you used on your order. If you already have a Microsoft Account set up using this email address, you will be directly able to log in to the Microsoft Volume License Center. You can then proceed to Step 3. If you do not have a Microsoft Account using this this email address then you need to create a Microsoft Account using this email address. Click on the link that reads “Don’t Have a Microsoft Account? Sign up Now” and create a new Microsoft Account using this email address. Once you have completed the sign up process, you will receive a validation email from Microsoft. Click on the link within the validation email to activate your account. You can now go back to the Microsoft Volume Licensing Service Center (Step 1) to sign in. It takes Microsoft approximately 2 hours after the receipt of this email message to update your information on the Microsoft Volume Licensing Center web site. Log in to your account 2 hours after you receive this email and accept the terms of the Volume License Agreement (Scroll down the Open License Agreement; enter your full name and click on ‘I Accept’). You will be now able to access the Volume License Keys and download the software from the Microsoft Volume Licensing Website. For any questions about this process you may contact Microsoft Licensing Support at 866-230-0560. 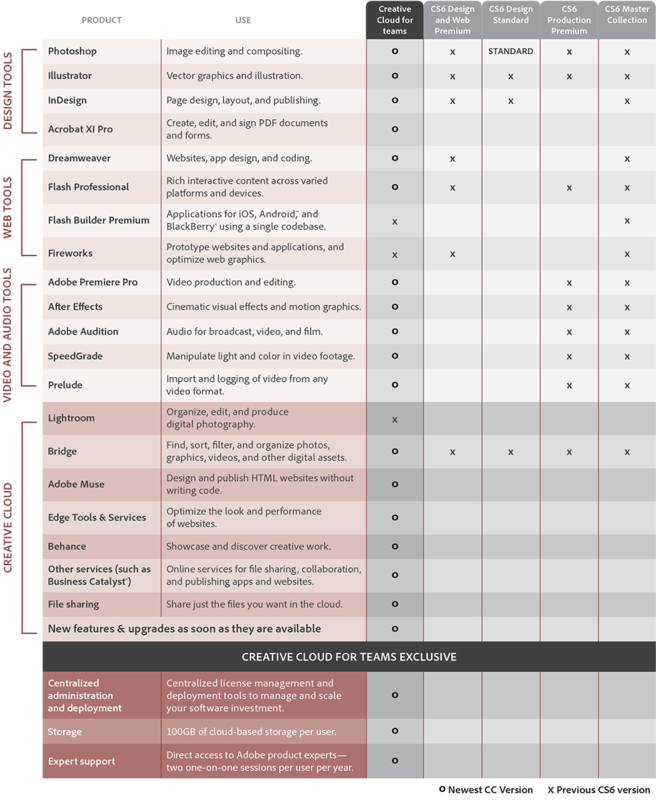 Here at Genesis Technologies we’ve been receiving a lot of questions about the Adobe Creative Cloud software. It always comes down to “Should I get a User License or a Device License?”. So I decided to make a simple chart that breaks down the differences. Take a look below! With the release of Adobe’s Creative Cloud for Teams, managing and distributing the software to your teams has never been easier. Still, we have many customers come back with questions about how to add user seats so their team members can start downloading their programs. Accept your VIP licensing agreement. You will receive your invitation to the VIP program in an email from your reseller (Genesis Technologies). Navigate to adminconsole.adobe.com to login (or create your Adobe ID for the first time). Click on the button to “Add User Seat” and choose the number of seats that you ordered through your reseller. Remember, even if you’re the administrator you will have to add a user seat for yourself to gain access to the programs. You may also receive a warning stating that you must place an order for these user seats. If you have already placed your order you can disregard. If not, we will be notified and get in touch with you shortly. Once the seats are added, you must assign an email address to that seat and that individual will receive an invitation to the Creative Cloud program. For a more in-depth guide, please take a look at the video below. Give us a call at 800-433-6326 if you have any other questions.